With the Consumer Electronics Show (CES) 2018 being just around the corner, Samsung has today bagged a patent for a smartphone design we’ve been expecting for years. The Korean giant may be planning to debut foldable devices this year but has already started toying with the idea of rollable scroll-like displays. According to Samsung’s newest patent spotted in the WIPO database (World Intellectual Property Organization), the company is conceiving a flexible display panel that can be housed inside a metallic main body. The patent describes that the rollable screen will come embedded with magnets, which would help you pull out or push the display back in to the body. Samsung has visualized two different scroll-like designs for the metallic main body, one cylindrical and the other rectangular. The prototype sketches are said to include a roller within the main body, which will spirally wind the flexible display with the help of strong magnets embedded in this design. 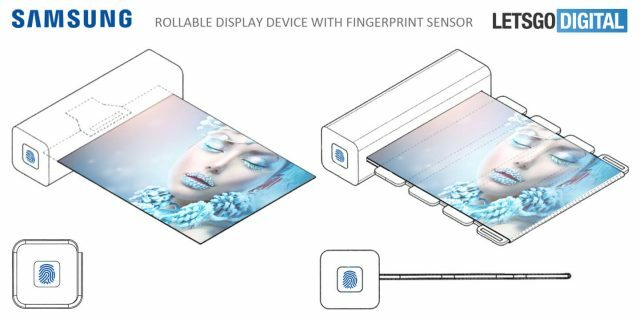 These devices also include a fingerprint sensor on the side of the main body to help open the rollable display with just a touch. As we step foot into 2018, we’ll certainly see most phone makers adopting the taller 18:9 aspect ratio. But, some others like Samsung will be toying with the concept of foldable or bendable displays in an attempt to break the mold and change the mobile devices ecosystem forever. We are not far away from a reality where such rollable displays will be packed inside cylindrical or rectangular tubes. And as the rumor mill suggests, Samsung already has prepared to show off its first foldable smartphone at CES this year. This foldable device is expected to be called the Galaxy X and one can say that it’ll be synonymous to the iPhone X, which means it is a testbed for a new design and technologies. The Korean giant has been working on foldable displays for the last seven odd years and it may finally come to fruition in 2018. So, does the whole prospect of foldable and rollable displays sound appealing to you as well? Let us know your opinions in the comments down below.